With Platinum I-CAR certification, aluminum frame and body accreditation, and a Partnership in Excellence Award from Standox automotive paints, we have the knowledge, experience, and technology to restore your vehicle back to original factory condition. 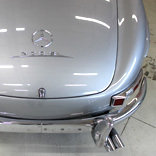 Flawless paintwork is crucial for proper repair and restoration of a vehicle. Paint preparation is an essential step in the process, and our two certified paint prep technicians ensure factory paint texture, consistency, and masking to eliminate all overspray. Utilizing two state of the art Garmat Downdraft Paint Booths, our Standox certified painter (with over 30 years of industry experience) is enabled to paint each and every vehicle to factory specifications. The Downdraft system allows for an environment completely free of debris and particulates. 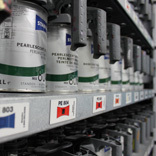 Our computerized Standox paint library is updated bi-weekly with all manufacturer paint codes, allowing us to create an exact color match for even the most intricate of two-stage and three-stage automotive paints. After each vehicle has been refinished, it is then baked in the booth from 165-180 degrees Fahrenheit, meaning it is ready for the road upon exit. As the frame is the structural foundation of the body, it is what is responsible for creating the safety and integrity of an automobile. Using a specialized spot welder, as well as two in house Chief Automotive Frame Racks, our technicians have the training, technology, and expertise to restore the strength and form of a frame. We strive not only to create a flawless repair for the outside appearance of a vehicle, but also for the structural integrity. All frame work is repaired to factory specifications, maintaining the safety, performance, and resale value of the vehicle. 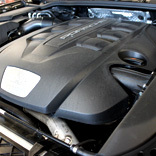 Most modern automobiles are manufactured with a uni-body construction, and require special training and equipment for proper repair and restoration. No corners are cut through the use of extensive filler, which can compromise the integrity of any vehicle. All damaged panels and parts are either completely repaired or replaced, to ensure the safety and sound quality of the vehicle. Our main goal throughout the body repair process is to achieve a final product that is indistinguishable from a factory manufactured automobile. Collision repair is our specialty, but all potential mechanical damages will be assessed, diagnosed, and repaired during the repair process as well. Our facilities are equipped with state of the art computer diagnostic systems, and our technicians are trained and experienced in both mechanical damage assessment and repair. If there is any issue that is beyond our capability, the vehicle will be sent to a certified dealership, so that the proper repairs may be made. 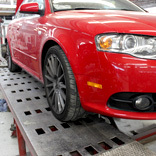 Any collision possibly involving suspension and alignment will be thoroughly checked and repaired to factory specifications, prior to the vehicle being returned. © 2012 Alpine Auto Renovation. All Rights Reserved.